We have completely unique 9×11 solid wooden designer plaques with your leagues sport and logo as one of the main features. This gives you a personal touch to thank those sponsors that help support your league throughout the year. Your sponsors now have the option to download a digital sponsor plaque instead of the standard wooden plaque. This is a perfect was for companies to showcase their contribution to your organization and their community using social media marketing avenues. Digital sponsor plaques are also great for businesses that do not have a public storefront. Do you have sponsors that support multiple teams? Providing these sponsors with several can get overwhelming! 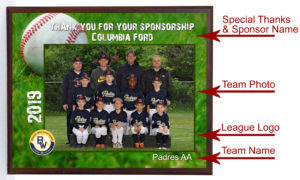 Your organization may choose to have a custom poster created that showcases all of the teams they have sponsored. This option will still include your organization’s name and logo as one of the main features and sponsors will still have the option to download it for social media purposes. For smaller leagues, there are often sponsors who donate to the entire league instead of one team in particular. 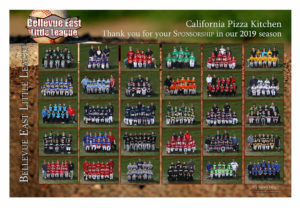 For these types of sponsors, many sports organizations choose to receive a 10×30 all league photo to give these generous businesses.